Background: Neuromuscular scoliosis is a common secondary complication following spinal cord injury (SCI). The common assumption in the literature and among medical professionals is that neuromuscular scoliosis is inevitable in individuals with damaged nervous systems who require full-time wheelchair use. Therefore, considering new-onset scoliosis as a treatable condition, not a permanent, inevitable complication, has significant quality-of-life implications. Objective: The research question that guided this study was: What is the lived experience for an individual with tetraplegia with new-onset neuromuscular scoliosis? More specifically, how did this condition impact his function and quality of life? And, what was the lived experience of interactions with healthcare providers during this episode of care? Method: Our participant was not specifically selected for this study; rather, he selected the researchers to investigate his lived experience. Our participant was compelled to share both the emotional turmoil of his experience and the successful outcome to provide research that will change the future approach to treating SCI individuals dealing with neuromuscular scoliosis. A phenomenological inquiry was conducted with qualitative comments extracted from our participant’s journal, medical records, and an interview and observations with our participant. Thematic analysis was conducted on all generated text. Results: The themes identified were: (1) feelings of social isolation, (2) diminishing productivity at work, (3) losing control of function, (4) decreased independence, and (5) negative mental status. Resolution of the scoliosis reversed the downward psychosocial spiral. Conclusion/Clinical Implication: This study offers a critical description regarding the lived experience of dealing with the psychosocial implications of the development of new-onset neuromuscular scoliosis in an individual with chronic SCI. Approximately 282,000 people in the United States live with spinal cord injury (SCI); an estimated 17,000 new cases occur each year.1 The injury greatly impacts young adults, typically those aged less than 30 years. Some authors report as high as 80 percent of SCIs occur in males.2,3 The extent of the neurologic injury varies depending on the location of the damaged spinal cord. Cervical spine injuries result in tetraplegia (impairment in trunk and all four limbs), whereas thoracic and lumbar spine injuries typically result in paraplegia (some degree of trunk impairment and impairment of lower limbs). Learning to cope with such an injury can be a lifelong process, from the initial shock of the trauma to incorporating newly learned skills for performing daily activities. Paraplegia and tetraplegia not only impact the function of the physical body, but also carry psychosocial implications. Co-morbid injuries or serious changes in health status are difficult for anyone to cope with; however, co-morbidities can be exacerbated in individuals with SCI who depend on a wheelchair for mobility because of the mental and physical challenges they already face daily. The development of secondary complications such as neuromuscular scoliosis can be physically debilitating to a person with tetraplegia because it impairs their functional ability to transfer, sit comfortably in their wheelchair, and perform activities of daily living. There is also an immense impact on psychological health because of the negative body image caused by a new spinal deformity. New-onset scoliosis may be particularly stressful for individuals with SCI due to the loss of the independence they worked hard to develop during their initial rehabilitation. However, how individuals experience such conditions has not been described. Thus, the purpose of this study was to uncover the lived experience of a man with tetraplegia and new-onset neuromuscular scoliosis, and the successful resolution of the new condition through nonsurgical interventions. Once neuromuscular scoliosis is established in a person with tetraplegia, misalignment of the joints can create a noxious stimulus, which increases spasticity that may contribute to further muscular contracture, establishing a cycle of worsening scoliosis. The common assumption in the literature and among many medical professionals is that neuromuscular scoliosis development is inevitable in individuals with damaged nervous systems who require full-time wheelchair use; a traumatic paralysis of the cervical spine is said to have a 100-percent incidence of developing scoliosis within 10 years of the originating injury.7 The majority of research focuses on surgical correction of neuromuscular scoliosis; there is a significant lack of research into conservative interventions. A different approach for correcting spinal deformity from neuromuscular scoliosis was used with the patient studied for this report. The treating physical therapist recognized that the new-onset neuromuscular scoliosis likely had a new precipitating cause and was compounded by functional scoliosis. Neuromuscular scoliosis is a lateral deviation of the spine that occurs in the presence of asymmetric tone of the paraspinal musculature due to a neurologic impairment. The condition is frequently compounded by gravity. Functional scoliosis is the result of the force of gravity working on unsupported structures when gravity has a moment arm. Functional scoliosis will reverse in a supine position, where gravity is eliminated. Therapeutic seating may be used to stop progression of functional scoliosis in an individual who is a full-time wheelchair user. The intervention in this case was to eliminate the confounding functional scoliosis and then quiet the asymmetric tone that was creating the neuromuscular scoliosis. The authors suggest that restoring function and independence by this conservative approach allowed the individual to regain dignity and a sense of control in his life. The research question that guided this study was: What is the lived experience for an individual with tetraplegia with new-onset neuromuscular scoliosis? More specifically, how did this condition impact his function and quality of life? And, what was his lived experience of interactions with healthcare providers during this episode of care? A phenomenological approach was used in this case study. Phenomenology is the study of consciousness or intent, deliberated from the first-person point of view. This philosophy is used to examine the ways a person associates meanings with a given experience.14 Our participant was not specifically selected for this study; rather, he selected the researchers to investigate his lived experience retrospectively to determine specific qualitative effects of his new-onset neuromuscular scoliosis compounded by his SCI. Our participant was compelled to share both the emotional turmoil of his experience and the successful outcome to provide research that will change the future approach to treating SCI individuals dealing with neuromuscular scoliosis. Primary data sources included our participant’s journal, an in-person interview with the participant that was audio-recorded and transcribed, notes from direct observation in the participant’s home and place of work, and subjective comments recorded in physical therapy (PT) documentation. We conducted thematic analysis of all the text material. The order of analysis was that of: (1) the journal, (2) PT documentation, and (3) the interview transcript. During the interview the initial coding scheme of the researchers was validated by the participant. Subsequently, the text of the transcript was analyzed. All analysis was done first independently by each of two investigators reading and coding the text that was meaningful in relation to the guiding questions. The initial coding was followed by a discussion for consensus to identify themes. Quotations from the transcripts were collated under these themes and organized by a timeline of before, during, or after the conservative intervention period. Our participant was a 48-year-old male with C6 complete tetraplegia that was stable for approximately 30 years prior to new-onset neuromuscular scoliosis. Our participant maintained a personal journal for two years during the episode of his neuromuscular scoliosis that documented his thoughts, feelings, and frustrations with his secondary physical changes, including his physical appearance and pain. His primary care physician attributed the neuromuscular scoliosis to his being an older wheelchair-dependent individual; he was referred for a surgical consultation for spinal fusion to prevent the progression of the spinal curve. Our participant previously had a fusion to stabilize his cervical spine directly following his SCI and was appalled at the surgeon’s recommendation to place a spinal rod from thoracic vertebrae 4 to lumbar vertebrae 3. Five major themes regarding the lived experience of our participant before the conservative interventions took place emerged from our research. The themes identified were: (1) feelings of social isolation, (2) diminished productivity at work, (3) losing control of function, (4) decreased independence, and (5) negative mental status. Our participant recounted experiencing these emotions not in a linear fashion, but with some overlap and circuity. I lost about a year and a half of comfortably socializing with family and friends. …I didn’t do as many activities, just didn’t want to, just wanted to go to bed when I got home. Although his wife and children were supportive during this year and a half, they also felt the compounding effects of isolation. Our participant’s involvement in relationships with his family and friends were put on hold due to physical pain, exhaustion, or feeling uncomfortable socially. As the neuromuscular scoliosis and pain increased, our participant felt as if his productivity at work suffered. He also felt that his bad seating posture created a poor image and that potential clients would not want to conduct business with him. Hard to put in the hours I needed to at work. …[P]hysical appearance is important to sell wheelchairs. Our participant was concerned about his posture creating a poor base of stability, therefore affecting his ability to manually propel his wheelchair and fully participate in activities of daily living. He reported his spasticity as being so intense that he felt as if he had to lean forward to prevent falling out of his wheelchair. Our participant lost considerable independence due to his decreased level of function. He reported that he became increasingly reliant on his wife for activities of daily living that he had performed independently prior to developing the neuromuscular scoliosis. [I]t was really hard on my wife because I would just need more help, I was in pain. In addition to the everyday stressors of life that he was dealing with, such as financially supporting children through college, home remodeling projects, and new work ventures, our participant began to feel distressed and hopeless over his intense pain, poor body image, low self-esteem, and feelings of guilt. He also felt he was a burden on his wife, which ultimately led to depression. I was suppressing stuff a lot, I was really down and frustrated. Positive change in all five themes was recognized in the data associated with completing the conservative intervention. The data collected in this study contains the lived experience of a high-functioning individual with tetraplegia and how he dealt with secondary neuromuscular scoliosis. Although the reaction to conservative treatment may have been different in another person, this participant’s motivation and drive to find a conservative treatment option was unique to his situation, due to his feelings of horror toward a surgical intervention. He felt that he was not being given a real choice and that he was not being listened to. Because of his pre-existing surgical fixation from his initial injury, a surgical intervention would have resulted in fixed rods placed along the majority of his spine to create a stable symmetrical spinal column. He believed that the rods would have prevented the spinal motion necessary for functional activities such as twisting and bending to get dressed, drastically changing his independence for the worse. Even in the predicament of loss of function due to the neuromuscular scoliosis and pain, he felt the offered solution to be considerably worse. Because this story is retrospective, one may not be able to assume that our participant traveled through his emotions in the exact fashion presented; however, our participant’s report conveyed that as his function and independence decreased he developed a spiraling loss of self-esteem. It is evident in the photos captured of him prior to the start of therapy that our participant appeared to have given up on his self-image. He presents extremely disheveled, in sweatpants, with messy hair. Once the intervention is completed, he appears to take pride in his physical appearance with ironed slacks, collared shirt, and a symmetrical seated posture. Our participant’s journals were limited in content and consistency, leading to gaps in reporting during the intervention period. Also, the in-person interview with our participant occurred more than a year after full correction of his scoliosis, which may have impacted the questions asked and our participant’s ability to recall facts and generate detailed responses to the interview questions. Nevertheless, the strength of this study is that the information is based within our participant’s lived experience in interactions with healthcare providers before, and during, the conservative intervention. When our participant met with the seating specialist, he described feelings of hopelessness and depression. The seating specialist took the time to listen to his concerns, understood how he was affected psychologically, and experimented with a treatment protocol that resulted in a successful outcome. Central to the difference in this interaction was the listening. The participant relayed that he had been in a motor vehicle accident and he thought it might have contributed to this new problem. However, he had gone for imaging and there was no sign of fractures; his physicians did not see any connection. The seating specialist did not see new-onset neuromuscular scoliosis as inevitable, nor even expected, and therefore took the approach of investigating why it had occurred now, rather than just treating its presentation. The distress of the patient was acknowledged and understood, and some immediate relief for functional difficulty was offered as well by temporarily configuring his wheelchair for more trunk stability and accommodating postural asymmetry. The exact cause that triggered the neuromuscular scoliosis is still unknown; however, the seating specialist hypothesized that it was due to the pull of asymmetrical muscle tone. This tone was presumed to be driven by a noxious stimulus, secondary to the recent motor vehicle accident. Despite the cause, once the tone developed and the malalignment was established, the lateral deviation became accentuated and perpetuated by gravity, pulling our participant into more significant spinal curvature and causing severe pain and decrease in function. Reversal of the negative psycho-social spiral began with listening, acknowledging, and then problem-solving in a collaborative manner. This study offers a critical description regarding the lived experience of dealing with the psychosocial implications of the development of new-onset neuromuscular scoliosis in an individual with chronic SCI. Our participant described the process of his downward spiral, developing feelings of loss of control that resulted in hopelessness and depression. His feeling of loss of control was a product of repeated instances of medical specialists presuming his condition to be an inevitable progression of his SCI and ignoring his requests for an alternative to surgical intervention. However, once he began the conservative treatment process with the seating specialist, he reported regaining self-esteem and an improved body image, as well as a sense of regaining control of his life. Qualitative information based within the individual’s actual lived experience through neurologic injuries and treatment is limited in the literature. Additional research should be conducted to further analyze the themes extracted in this study to increase the generalizability and applicability to all patients with secondary neuromuscular scoliosis. Based on the results reported in this study, treating clinicians should emphasize the individual patient’s goals, expectations, and beliefs regarding causation, be unafraid to explore various treatment protocols, and consider the psychological implication of all impairments. The author would like to thank our participant for his time and commitment to this project so that this research can benefit others in similar situations in the future. 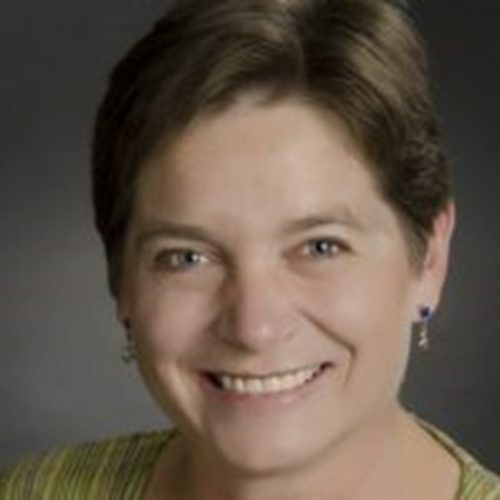 This work is based upon a project completed by Christine Baniewich and Cedar Levine as part of their DPT education at the University of Puget Sound; the author was the treating clinician. We would also like to acknowledge our peer reviewers. National Spinal Cord Injury Statistical Center, Facts and Figures at a Glance. Birmingham, AL: University of Alabama at Birmingham, 2016. Bernhard M, Gries A, Kremer P, Böttiger BW. Spinal cord injury (SCI) – prehospital management. Resuscitation. 2005;66(2):127–139. Burke DA, Linden RD, Zhang YP, Maiste AC, Shields CB. Incidence rates and populations at risk for spinal cord injury: a regional study. Spinal Cord. 2001;39(5):274–278. Zdanowicz N, Lepiece B, Tordeurs D, Jacques D, Reynaert C. Predictability of levels of physical and mental health in adults and adolescents: a 2 years longitudinal study. Psychiatria Danubina. 2012;24:9–13. Goodman CC, Fuller KS. Genetic and developmental disorders. In: Pathology: Implications for the Physical Therapist. 3rd ed. Louis, MO: Saunders/Elsevier; 2009;1108-56. Obid P, Bevot A, Goll A, Leichtle C, Wülker N, Niemeyer T. Quality of life after surgery for neuromuscular scoliosis. Orthop Rev. 2013;5(1):e1. Mulchey MJ, Gaughan JP, Betz RR, Samdani AF, Barakat N, Hunter LN. Neuromuscular scoliosis in children with spinal cord injury. Top Spinal Cord Inj Rehabil. 2013;19(2):96-103. Maruyama T, Grivas TB, Kaspiris A. Effectiveness and outcomes of brace treatment: a systematic review. Physiother Theory Pract. 2011;27:26-42. Rivett L, Rothberg A, Stewart A, Berkowitz R. The relationship between quality of life and compliance to a brace protocol in adolescents with idiopathic scoliosis: a comparative study. BMC Musculoskelet Disord. 2009;10:5. Vasiliadis E, Grivas TB, Gkoltsiou K. Development and preliminary validation of Brace Questionnaire (BrQ): a new instrument for measuring quality of life of brace treated scoliotics. Scoliosis. 2006;1:7. Master DL , Connie PK, Jochen SH, et al. Wound infections after surgery for neuromuscular scoliosis: risk factors and treatment outcomes. Spine. 2011;36(3):E179-185. Master DL, Son-Hing JP, Poe-Kochert C, et al. Risk factors for major complications after surgery for neuromuscular scoliosis. Spine. 2011;36(7):564-571. Kiecolt-Glaser J, Page G, Marucha P, MacCallum R, Glaser R. Psychological influences on surgical recovery: perspectives from psychoneuroimmunology. Am Psychol. 1998;53:1209-1218. Moran D. Introduction to Phenomenology. London, England; New York, NY: Routledge; 2000. Hastings JD, Dickson J, Tracy L, Baniewich C, Levine C. Conservative treatment of neuromuscular scoliosis in adult tetraplegia: a case report. Arch Phys Med Rehabil. 2014;95(12):2491-2495. Recently, 10 fourth-year Penn State medical students gathered for a humanities seminar course on the art of observation. The class began with a challenge to examine Andrew Wyeth’s painting Christina’s World for 30 seconds, observing as many details as possible, then to look away and sketch on paper all they could remember. Most of them drew the landscape—an expansive grassy field with a distant farmhouse, barn, and outhouse perched at the upper edge of the painting. One student remembered a flock of birds flying near the barn; others drew stick figures of a woman on the ground crawling in the direction of the house. Like forensic detectives, the class returned to examining the painting for clues, first describing the mood Wyeth creates, using adjectives such as “mysterious,” “isolated,” “lonely,” and “foreboding.” They wanted to know more. Who is this woman whose faded pink dress is highlighted by sunlight? Why is she alone in the field, and what brought her to this place? Why must she crawl, propelling herself with her arms while her legs appear useless? Who lives in the house on the hillside? Through eyes of soon-to-become physicians they identified signs of a chronic disease—weak legs, wasted arms, and contorted, knobby hands. Despite her apparent physical limitations, this woman appears resolved to reach the farmstead using every ounce of strength she possesses. Figure 1: Andrew Wyeth, Christina’s World, 1948, tempera. Museum of Modern Art, New York, ©Artist Rights Society (ARS), Image permission: Art Resource, NY. Wyeth ultimately completed four paintings of Christina. 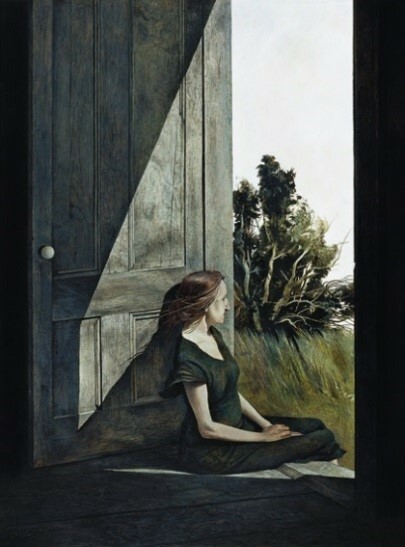 In the first one, titled Christina Olson (1947) (Figure 2), she sits alone in a doorway surveying the landscape. Wyeth biographer Richard Meryman noted that the artist described this painting as Christina “looking out to sea ‘like a wounded gull.’”3(p20) A shaft of sunlight catches a profile of her rugged face, simple black dress, and atrophied forearms and hands. She appears still and perhaps vulnerable, but nonetheless reconciled to her place in life. He worked on Christina’s World throughout the summer of 1948, convincing Christina to pose for him in the field. 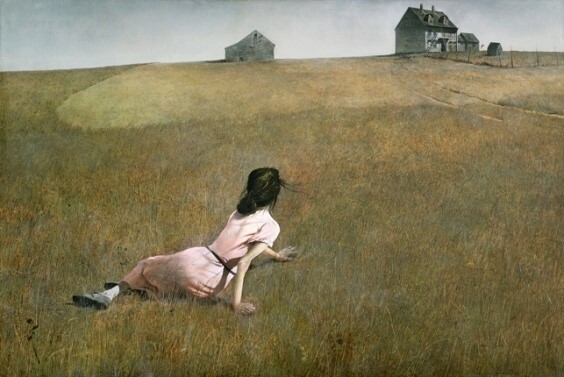 Although Wyeth skillfully drew her wasted arms and distorted hands, he chose to substitute images of his wife Betsy’s torso and his Aunt Elizabeth’s hair.3(p20) He placed the image of Christina farther away from the house, down the hill near the Olson family burial site,3(p8) perhaps to symbolize the depth of her emotional strength and determination in life. The finished painting was hung on the wall above the sofa in the Wyeth cottage in September 1948. At dinner one evening Wyeth summoned up the courage to ask Christina how she liked it. She gave it her blessing by drawing his fingers to her lips.3(pp21-22) However, Wyeth was disappointed with it, and according to Meryman, believed it was “a complete flat tire.”3(p22) The public did not share this assessment. In rapid succession, the painting was purchased by the Macbeth Gallery in New York and, by December 1948, acquired by the Museum of Modern Art,3(p22) where it is currently viewed by millions of visitors each year. Today, Christina’s World is widely recognized as one of America’s most treasured works of art. The study of medicine requires the acquisition of scientific knowledge and of the skills of listening to the patient’s complaints and observing characteristic physical findings and laboratory data in order to make a specific diagnosis. The art of medicine involves something more—the development of an empathic understanding of the patient’s lived experience of illness. By analyzing and understanding the context of works of art such as Christina’s World, medical students learn to sharpen observational skills and heighten empathic awareness. Komanecky M, Nakamura O. Andrew Wyeth, Christina’s World and the Olson House. Rockland, ME: Farnsworth Art Museum (in conjunction with Skira Rizzoli Publications, Inc., New York, NY); 2011:22-23. Anderson R. Christina’s World: American icon and medical enigma. Pharos. 2007(Summer);70:6-7. Meryman R. Andrew Wyeth:A Secret Life. New York, NY: HarperCollins; 1996:8-10. Mackowiak P. Andrew Wyeth, Christina Olson, and the art of medicine. Pharos. 2015(Summer);78:16.